It is believed that when the god Nu Wa created the world, it was the chicken he made on the first day (of Chinese New Year), dog on the second, pig on the third, goat on the fourth, buffalo on the fifth and horse on the sixth. On the seventh day, human was created (hence it is the birthday for all man on the 7th day of Chinese New Year). These 6 livestock were very important for the Chinese who are agriculture based for a long time, they are seen as a symbol of blessing (they made up half the 12 zodiac animals). Legend has it that a long time ago on a mount in Chong Shan lived a golden rooster who like a alarm would crow at the same time every morning. Hearing the crowing, people who lived a the mount opposite would ring the bell to wake all the villages around. The golden rooster has a habit of snacking off the vegetable field, one day a farmer was angry at the rooster for damaging his crops and curse on it. With the curse, the golden rooster fell from the mount and landed on by the river and turned into a large piece of rock, since then no crowing can be heard again. 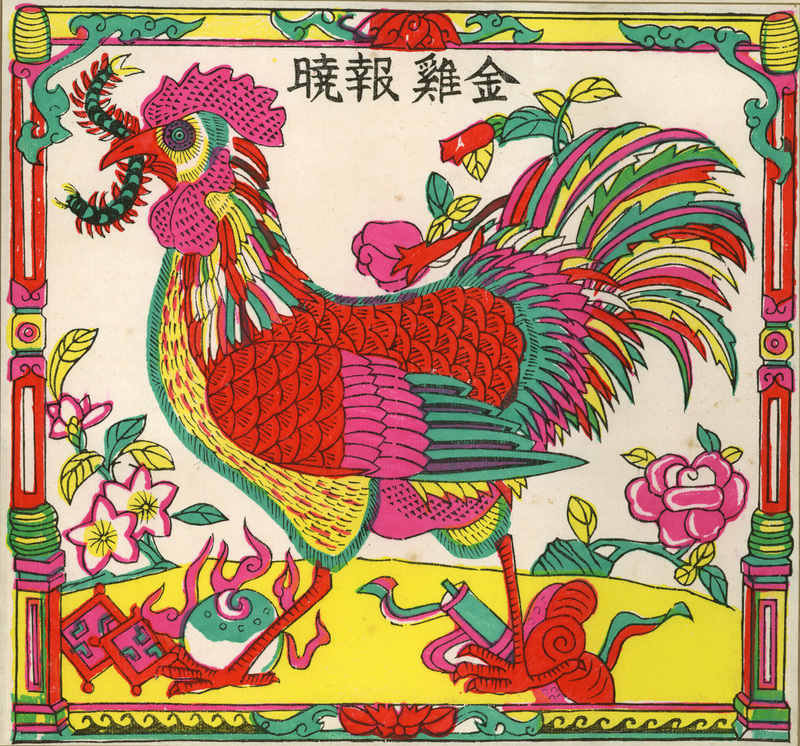 This is a wood block print of the golden rooster crowing, a blessing.